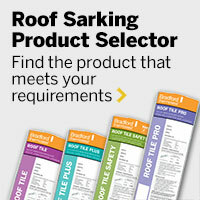 There's only one opportunity to install roof sarking, and that's while you build. Whether it’s as reflective thermal insulation, a protective second skin against burning embers in a bushfire area or as a way to control condensation, CSR Bradford has a sarking solution to suit your needs. Thermoseal reflective foil roof sarking is a non-permeable, vapour barrier to reduce the transmission of moisture into the home and contribute R-Value to the roof system. Recommended for use in warmer climates. Enviroseal ProctorWrap roof sarking is vapour permeable, allowing water vapour to pass through it, whilst preventing the entry of liquid water and dust from outside. Recommended for use in colder climates. 1: In combination with sealing openings greater than 3mm. Full BAL systems include Multitel BAL blanket and other design elements – refer to the Bradford Bushfire Design Guide. 2: All sarkings should be installed with a minimum of 150mm overlap to facilitate drainage.